The Prince squash bags we have at Squashpoint stand out not only in terms of storage space and layout but also when it comes to quality. Compared to average racket bags, the Prince squash bags offer you that little bit of extra storage space that comes in handy. In addition, all Prince squash bags have a practical design and many extra storage compartments so that not only your rackets but also all your clothing and accessories such as balls and grips can be stored quickly and found again easily. The Prince Tour Future 6 Pack even has an integrated key ring so you will never again have to rummage through your bag in search of your keys. Prince has also thought about the competitive player who is often longer on the road and needs to take along some food and drinks. The handy built-in cool box in the Prince Tour Challenger 9 Pack keeps your snacks fresh and cool. In addition, Prince have thought about other practical issues such as where you can store your laptop or iPad and how you can keep your phone scratch-free in the bag. The Prince Tour Dufflepack is even equipped with a pocket for your phone that has a special opening through which you can push the cord of your headphones, allowing you to listen to music while your phone is safely stored in your bag. 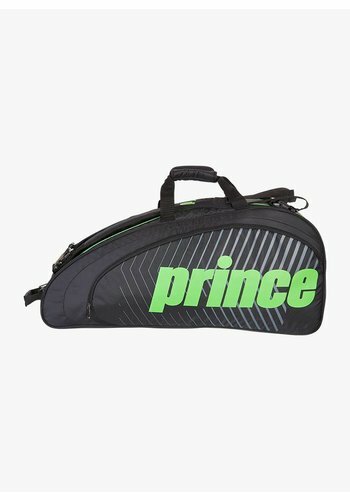 A practical racket bag with nice features. A practical racket bag with handy features. A unique backpack with many useful features.